1. Never ever go to office, for a meeting or anywhere with wet hair. Always take the time to blow dry and style it. Wet hair shows a lack of time management skills. 2. For a working environment, your hair should always be above your shoulders. If you have long hair, tie it up into a pony or a chignon. Long, flowing hair is too feminine and people might not take you seriously. Again this rule depends entirely on your work environment. 3. Hair colour should be very subtle and professionally done. Avoid hennaed hair, light blonde and red highlights. Your bangs or fringe should not be constantly falling in your eyes. It is very distracting to other people and also hinders your work performance. 4. Accessories and jewelry should be kept to a bare minimum. Subtle and elegant pieces in gold, silver, platinum or pearls. Or one gorgeous statement piece. Always take off the last piece of jewelry you put on as a rule to avoid overdoing it. Stay away from dangling, noisy, Neon and plastic jewelry. Your rings and marital jewelry should be kept to a bare minimum. Religious gemstones, threads, mangalsutras, sindoor, tavis, rudrakshes should preferably be avoided. Your accessories checklist should not exceed a 1 ring on either hand, a gold, silver or leather banded watch, an elegant neckpiece, a subtle bracelet and subtle earrings. Remember to match your metals! 5. Makeup is meant to enhance your natural beauty not camouflage your features. 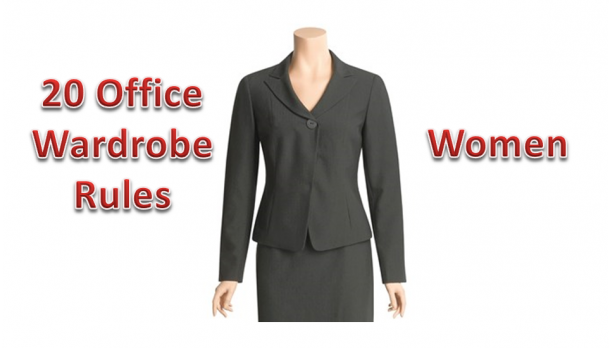 Take help from a professional and learn how to do an office look. Keep your colours simple and matching your skin tone. If you don’t know how to apply eye makeup, please take classes. There is nothing worse than talking to someone with crookedly applied eyeliner and smudged blue eye shadow or purple lipstick. Again use makeup to enhance your natural beauty not to distort your features. 6. Consistency in your appearance and visual impact is very essential, especially for women in any field. Invest in a good quality capsule wardrobe. Write down what you need and only then go shopping or again invest in professional help. 7. Schedule regular fortnightly trips to the salon and skin doctor. Keep your skin moisturized and waxed. Your eyebrows and upper lip waxed / threaded. Hands and feet manicured and pedicured. It’s better to have no nail polish than peeling nail paint. Nail colours should be subtle and the nail length within decent limits. A busy life is no excuse to neglect your personal self. Remember grooming plays a huge role in how people perceive you. And if not other people you need to do it for yourself. 8. Invest in good fabrics, they last longer and are easier to maintain. Buy less clothes but the best quality you can afford. Invest in fabrics like silks, light wool, cottons, knits and crepes. Mixes with Tencel, Modal and Lycra improve the fit and texture of the cloth. Steer clear of artificial fabrics like shiny rayon, polyester and nylon. Avoid linen for long working hours and public transport. 9. Always pay a lot of attention to your lingerie. They are the building blocks of your wardrobe and can make or break your outfit and your image. Correctly fitting lingerie can visibly reduce around 2-3 kgs and give you a great figure. Your lingerie should never ever be visible through your clothes. No VPL and no colourful/ dirty/ faded bra straps. Indian women often ignore their lingerie drawer without realizing it’s impact on their entire look. 10. Be very aware of your necklines. Not even a hint of cleavage should be available. Always wear a shell or a matching spaghetti under a shirt or blouse with a low neckline. Buy shirts a size larger and have them tapered down with the tailor. Your shirt buttons should fall smoothly and not strain across your chest or stomach. Always get the shirt buttons or hooks readjusted with the tailor. 11. Buy garments that are classic, tailored and structured for your body type. Stay away from fashion trends and fads. Keep them for the weekend parties. 12. Indian women are lucky to have so much variety in their working wardrobe! Besides western wear, sarees and churidar kurtas look great and are also comfortable for long working hours and train travel. Avoid any form of embroidery and garish colours while wearing indian wear. Crisp cotton sarees and kurtas look fabulous! a. Wearing two or more colours that don’t match, mixing prints and patterns, large floral patterns, patterned and coloured pants, embroidery, wearing fads. b. Showing cleavage, midriff or too much thigh, clothes that are too tight or too loose, shorts, capris, long slits, evening wear, evening party tops, spaghetti straps, gym wear and frilly blouses. c. Old and worn out clothes, puckered seams, stains, t shirts with slogans, stitching undone. d. Transparent clothes, silver or gold fabric, sequins, satin, lace, spandex and figure clinging fabrics. 14. If you have a tattoo in a visible area, use concealer or clothes to cover it on a daily basis. The only thing pierced in a visible area should be your ears. 16. Heels over 3 inches are considered unprofessional. As are studs, thick ankle straps and boots. 17. Very often people are allergic to strong perfumes, try and avoid heavy scents especially while working in a closed office environment. 18. Please do not wear obvious in-your-face designer labels especially if they are fake. A discreetly expensive item is always noticed and appreciated. 19. If you are confused and don’t wish to take professional help, take a look at the powerful women around you, try and emulate the style of the woman you admire the most. Since most of them do have wardrobe planners, it would be difficult for you to go wrong. 20. Always carry a mini survival kit with you. Get sample sizes of your favorite skin care and perfume. Carry wet wipes, sanitizer, basic makeup etc and keep a change of clothes at your workplace in case of minor accidents. Can I wear formal skirts to interviews?